Cavite City, Philippines (CNN) -- Not many people recognized Efren Peñaflorida as he left the Philippines last fall to attend a Hollywood gala for CNN Heroes. But when Peñaflorida returned from the event as CNN's Hero of the Year, he was greeted by hundreds of screaming fans at the airport in Manila. "The moment we got home, I ... seemed to have become a celebrity," he said. Peñaflorida was honored for creating mobile "pushcart classrooms," carts stocked with books, chalkboards and other supplies, that bring education to poor children in the Philippines. Since 1997, he and more than 12,000 teenage volunteers have taught basic reading and writing skills to more than 1,800 children living on the streets. "The award and the title [are] really significant," said Peñaflorida, 29. "It gave me and my co-volunteers an affirmation that what we are doing is a worthy cause." The plaudits didn't stop there. Back home, parades were arranged in both Manila and Cavite City, where Peñaflorida was born and raised. And then-President Gloria Arroyo conferred him with the Order of Lakandula -- one of the highest honors that can be bestowed upon a Filipino civilian -- for his dedication to the welfare of society. "I received the medal but shared the honor with my co-volunteers, my mentor and the children we reach out to," he said. "The government heads received an instruction from the president to have the pushcart schools replicated all over the country." With Peñaflorida's consultation, the pushcart classroom model started by his nonprofit organization, Dynamic Teen Company, has been replicated more than 50 times by different organizations and institutions across the Philippines. And according to Peñaflorida, more classrooms are pending as President Benigno Aquino's administration reviews plans to expand the infrastructure of the mobile classroom system. "The duplication of the pushcart school system ... is happening now in different provinces and regions of the country, and we receive numerous letters from other parts of the world," Peñaflorida said. "Filipinos have become more aware of the need for these children to be educated, fed and taken care of. 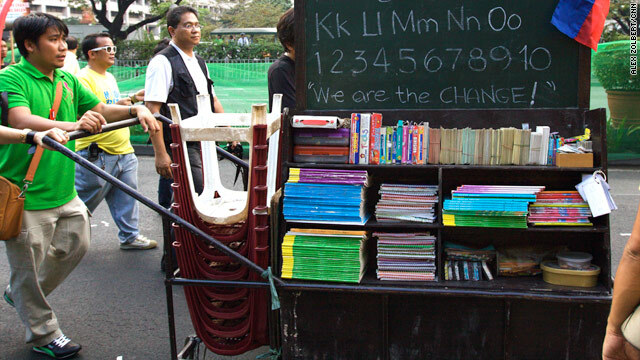 Before, they saw [a pushcart] as a symbol of poverty, but now they see a pushcart as a symbol of hope and education." In Cavite City, construction is nearly complete on the Dynamic Teen Company's new educational center, which is designed to resemble the iconic pushcart. Partially funded by the CNN Heroes grant of $125,000, the educational center will include a computer lab, a library, a health clinic, a kitchen used for feeding programs and a garage to store the pushcarts. "We will call it Care for Poor Children Learning Center, where children will experience having a place to exercise their rights freely and learn life-changing principles," Peñaflorida said. "It is intended to be finished by early next year ... and [it] shall be able to serve hundreds of kids." Peñaflorida says he knows firsthand what these children lack. He spent his childhood in a shanty near a dump site in Cavite City. He founded his organization to provide impoverished children an empowering alternative to gang induction. Before, they saw [a pushcart] as a symbol of poverty, but now they see a pushcart as a symbol of hope and education. "They need education to be successful in life," he said. "It's just giving them what others gave to me." Peñaflorida's selflessness has inspired documentaries and TV movies about his life in the Philippines and several other countries, including Japan, Korea, Germany, Spain and Canada. Recently, he was invited to bear the torch at the first Youth Olympic Games in Singapore. And he can be seen hosting his own search for heroes on the Philippine television show "Ako Mismo" ("I Myself"). The show features people working in the Philippines to better the lives of others. "I was told ... that they came up with this TV show inspired by the speech I gave at the Kodak Theater, that each person has a hidden hero within ... waiting to be unleashed," he said. "Since I was instrumental in the concept, I must live up to the principles I share and help our country find its heroes and probably help our nation heal herself." November 22 will be Efren Peñaflorida Day in Cavite City, but Peñaflorida will likely miss the celebration as he plans to be back in Hollywood honoring this year's CNN Heroes. "They are all awesome," he said. "The works of those 25 souls are so inspiring and truly remarkable. I personally salute them all." The 2010 Top Ten CNN Heroes will be announced Thursday, September 23 at 1 p.m. on CNN.com. At that time, online voting will begin to select the 2010 CNN Hero of the Year. The Hero of the Year will be revealed Thanksgiving night during "CNN Heroes: An All-Star Tribute," hosted by Anderson Cooper at the Shrine Auditorium in Los Angeles, California.